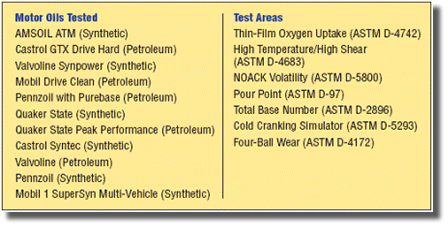 AMSOIL Synthetic 10W-30 Motor Oil (ATM) and 10 competing conventional and synthetic 10W-30 motor oils were subjected to a series of API motor oil tests. The competing oils included petroleum-based Castrol GTX Drive Hard, Mobil Drive Clean, Pennzoil with Purebase, Quaker State Peak Performance and Valvoline, as well as synthetic-based Valvoline Synpower, Quaker State, Castrol Syntec, Pennzoil and Mobil 1 SuperSyn Multi-Vehicle. Seven API tests were run on the motor oils. 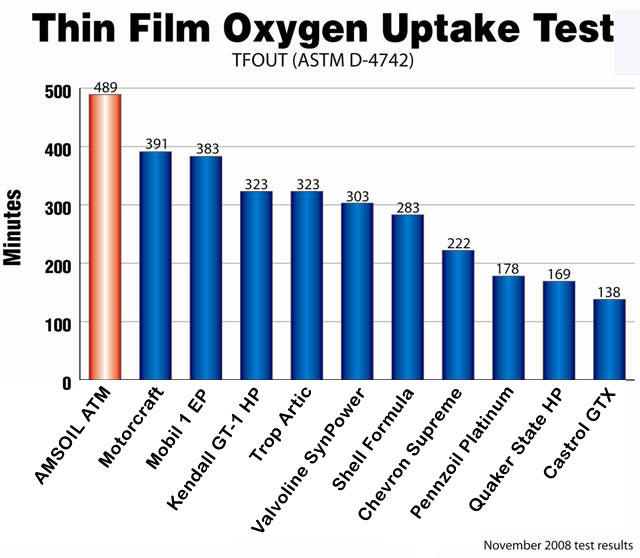 The Thin-Film Oxygen Uptake Test (TFOUT) measures the oxidation stability of engine oils. The High Temperature/High Shear Test (HTHS) measures a lubricant’s viscosity under severe operating conditions. The NOACK Volatility Test measures the evaporation loss of oils in high temperature service. Pour Point indicates the lowest temperature at which a fluid will flow. Total Base Number (TBN) is the measurement of a lubricant’s reserve alkalinity for combating acids. The Cold Cranking Simulator Test (CCS) measures a lubricant’s viscosity at low temperatures and high shear rates. 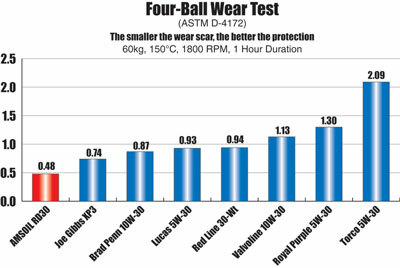 The Four-Ball Wear Test measures a lubricant’s wear protection properties. The impressive test results show AMSOIL Synthetic 10W-30 Motor Oil outperformed the competitors in each test. The Thin-Film Oxygen Uptake Test evaluates the oxidation stability of lubricating oils. A mixture of the test oil and chemistries found in gasoline engine operation (oxidized/nitrated fuel, soluble metals and distilled water) are placed in a test vessel, which is pressurized with oxygen and placed in a heated bath. Anti-oxidant breakdown is evident when the oxygen pressure in the vessel rapidly decreases. At this point, the induction time (break point) of the oil is recorded. 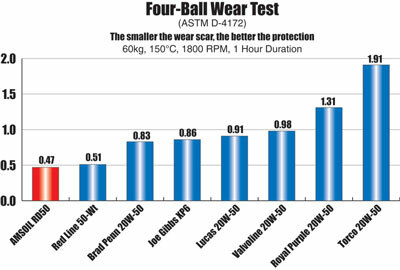 As shown in the graph, AMSOIL Synthetic 10W-30 Motor Oil had the highest induction time of all the tested oils. In fact, it didn’t reach its break point in over 500 minutes of testing. The High Temperature/High Shear Test measures a lubricant’s viscosity under severe high temperature and shear conditions that resemble highly-loaded journal bearings in fired internal combustion engines. In order to prevent bearing wear, it is important for a lubricant to maintain its protective viscosity under severe operating conditions. The minimum High Temperature/High Shear viscosity for a 30 weight oil is 2.9 cP. 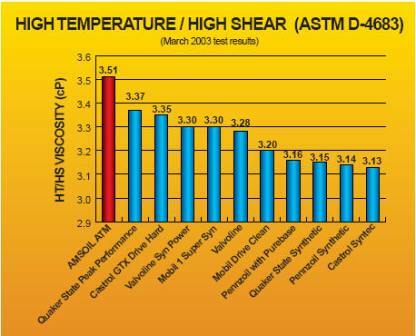 As shown in the graph, AMSOIL Synthetic 10W-30 Motor Oil surpasses this minimum standard and displayed the highest High Temperature/High Shear viscosity in the group. 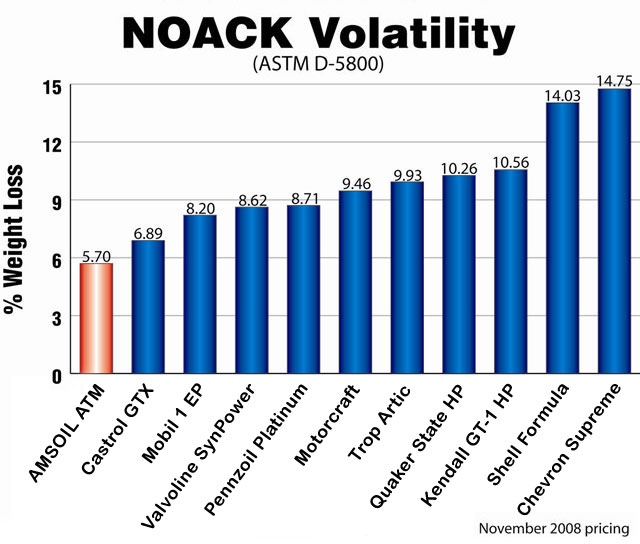 The NOACK Volatility Test determines the evaporation loss of lubricants in high temperature service.The more motor oils vaporize, the thicker and heavier they become, contributing to poor circulation, reduced fuel economy and increased oil consumption, wear and emissions. A maximum of 15 percent evaporation loss is allowable to meet API SL and ILSAC GF-3 specifications. As shown in the graph, AMSOIL Synthetic 10W-30 Motor Oil outperformed its nearest competitor by over 30 percent. The Pour Point Test determines the lowest temperature at which a lubricant will flow when cooled under prescribed conditions. The lower a lubricant’s pour point, the better protection it provides in low temperature service. 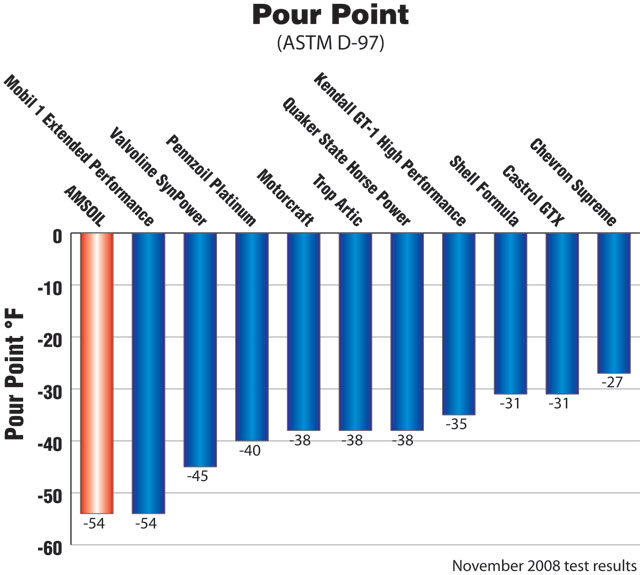 As shown in the graph, AMSOIL Synthetic 10W-30 Motor Oil has the lowest pour point of the tested oils. The low pour point of AMSOIL Synthetic 10W-30 Motor Oil allows it to maintain its fluidity in extremely low temperatures, reducing drag on moving vehicle parts, providing critical engine components with quick, essential lubrication and easing startup in cold temperatures. Wear is greatly reduced and equipment life is extended. Total Base Number (TBN) is the measurement of a lubricant’s reserve alkalinity, which aids in the control of acids formed during the combustion process. The higher a motor oil’s TBN, the more effective it is in suspending wear-causing contaminants and reducing the corrosive effects of acids over an extended period of time. 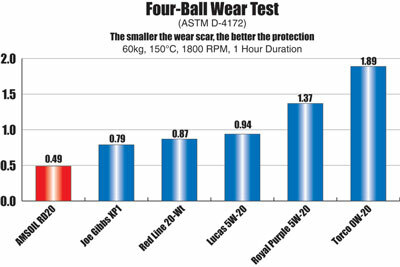 As shown in the graph, AMSOIL Synthetic 10W-30 Motor Oil has the highest TBN of the tested oils. The Cold Crank Simulator Test determines the apparent viscosity of lubricants at low temperatures and high shear rates. Viscosity of lubricants under these conditions is directly related to engine cranking and startability. The lower a lubricant’s cold crank viscosity, the easier an engine will turn over in cold temperatures. 10W motor oils are tested at -25°C and must have a viscosity below 7000 cP to pass. 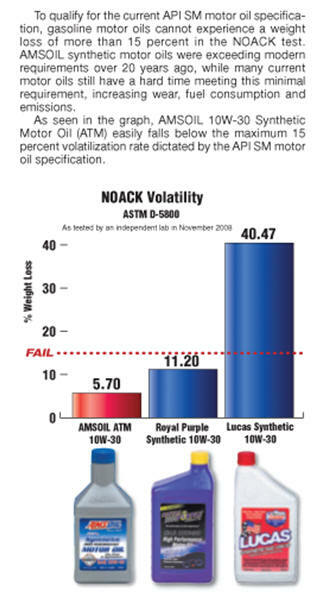 As shown in the graph, AMSOIL Synthetic 10W-30 Motor Oil is well below the maximum requirement, while many of the competing oils barely pass. AMSOIL INC. has been the leader in synthetic motor oil formulation since its introduction of the world’s first API rated synthetic motor oil in 1972. By specializing exclusively in synthetic lubricant technology, AMSOIL is able to optimize the most advanced chemistries available. The “Genuine Synthetic PAO Formulated” designation displayed on AMSOIL packaging indicates that the oils are formulated with Polyalphaolefin (PAO) synthetic base stocks. This chemistry is the industry’s premier base stock technology. Unlike conventional mineral-based chemistries, AMSOIL PAO base stocks contain fully saturated, hydrogenated molecules and are free of wax and other impurities. Combined with an exact balance of premium additives, it delivers superior hot and cold temperature performance, resists oxidation and acid formation and provides long-term wear protection. AMSOIL “Genuine Synthetic PAO Formulated” oils have shattered the parameters of the most rigorous industry testing and set the standard for all other motor oils. As you may know, Royal Purple is well known in racing circles. 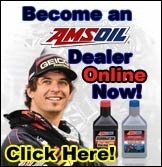 The chemistry they use is something AMSOIL, Inc. chooses not to use in their oil formulation. One of Amsoil's big selling points is extended drain intervals, such as our 25,000 mile and 35,000 mile oil change intervals. Some additive chemicals such as Moly may cause adverse conditions when used for long periods. Royal Purple uses a different chemistry than most oil producers. They are one of only a handful of marketers using Molybdenum Disulfide (Moly) in their oil formulations at these higher levels. Moly is a processed mineral that is similar in appearance to graphite. Moly has good lubricating properties when used either by itself (in dry power form or as an additive to oil or other lubricants). Particles of the Moly can come out of suspension and agglomerate. Over time this may actually clog or partially clog oil filters or oil lines and the remainder normally settles in the bottom of the oil pan. This seems to be more likely when using extended drain intervals. The only test we ran on Royal Purple involved their 20W50 Racing oil versus our AMSOIL Series 2000 Synthetic 20W50 Racing Oil (TRO). We ran two 4 ball wear tests with different parameters, a spectrographic baseline, FTIR scan and volatility tests. The Royal Purple showed a significantly high volatility rate with a 12.51% boil off rate. This compares to the AMSOIL TRO with only a 4.47% volatility rating. Wear scars were also smaller with the TRO. For example the AMSOIL TRO left a .41mm scar and the Royal Purple oil left a .66mm scar. The lower the scar damage number the better! There was also a surprising difference in the viscosity index. The RP has a VI of 129 versus 155 for the TRO. The higher the VI, the better the viscosity stays in place at high temperatures. Note: This information was provided by AMSOIL, Inc. Tech Department. An independent lab tested the Royal Purple 20W-50 racing oil against the AMSOIL 20W-50 racing oil. The results are posted above. Test results found Moly in the Royal Purple oil sample.